One of the biggest benefits of cooking with a halogen oven is food turns out so much more flavoursome than it does in many other cooking devices, including microwave ovens. When cooked in a halogen oven, meats and poultry are brown and crispy on the outside but remain amazingly moist and succulent inside. These devices are truly amazing at sealing in food flavours and juices. Halogen ovens offer a significant benefit of moisture retention - with a standard convection grill, hot air passes over the food and carries away some of its moisture and juices. Eventually the food will dry out - with a halogen oven, however, infrared energy has the opposite effect. It drives moisture deep inside the food being cooked - hence the flavour is enhanced and the food is noticeably more succulent. What Foods do Halogen Ovens Cook Well? There isn’t really much a halogen oven doesn't cook well - and you'll get really pleasing results it you have above basic cooking skills to begin with. A halogen oven isn't going to turn a poor chef into a great one - but with a bit of practice most people should be able to get some pleasing results from one of these versatile little cookers. Here's an overview of some types of foods that are really suited to cooking with halogen power. Full Chickens - these can be cooked to perfection with halogen power, provided you get your timing right. If everything goes to plan a full chicken will turn out golden brown and moist, not dry at all. Pork & Beef - a halogen oven will cook almost any meat so it turns out tasting delicious - you can even get crunchy crackling on a pork shoulder, just like you would in a conventional oven - but with a lot less fuss and mess. Steaks come out with a char if you want them to and bacon can be cooked just how you like - it can even be nice and crispy, which you'll never achieve in a microwave oven! Baked potatoes - a halogen oven works wonders when it comes to baked potatoes. They come out tasting firm an crispy on the outside and soft and fluffy on the inside. Again, that something you won't achieve in a microwave. Pizzas - these are ideally suited to halogen cooking and turn out firm and crispy around the edges, but still soft and wholesome - that's something a microwave isn't capable of. Burgers - these are a real favourite with halogen oven owners and turn out tasting truly wonderful. Hot dogs are another option that goes down well with kids. And if you want to serve up something really quick and simple for kids, then beans on toast is another easy snack to serve up. Frozen Foods - a real attraction of a halogen oven is that you can cook many frozen foods right out of the freezer. There's often no need to thaw or pre-heat. Frozen sausages, pies, burritos and even vegetables - a halogen oven can deal with them all! Large meat joints, however, are best to be thawed before cooking. Re-heating Foods - a halogen oven excels at re-heating foods so there's no need to throw any left overs from previous meals. There are some foods and meals that are not really suited to halogen oven cooking - few people have success when attempting scrambled and fried eggs, for example. And boiled eggs can be a bit hit and miss. This doesn't mean eggs are a complete no-no - you should have no problem with quiches or cakes, for example, where eggs are just one ingredient among others. Halogen oven cooking is a real time saver! Speed is a wonderful benefit of cooking with halogen power - it beats a traditional oven hands down by cooking food up to three times more quickly. For example, you can cook beef ribs in 20 minutes. Simple fruit based desserts can be cooked very fast and easily. You can also use a halogen oven to make a meat or fruit pie, casserole, curry, sauce or stew - all in super quick time compared to using a conventional oven or hob. These ovens are also superb for heating up pasties, donuts or other foodstuffs which would become very soggy if cooked or warmed up in a microwave oven. Here's a few cooking times to give you an idea of how long it takes to prepare various foods in a halogen oven. >> Roast Beef (1K) takes around 75 minutes to cook at 180 degrees centigrade on a low rack. >> Steak takes around 8-10 minutes to cook at 250 degrees centigrade on a low rack. >> Cod steak (150g) takes around 25 minutes to cook at 200 degrees centigrade on a high rack. >> Bacon/sausage takes around 8-10 minutes to cook at 250 degrees centigrade on a low rack. 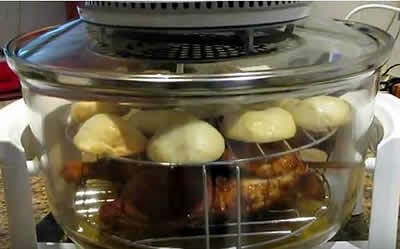 >> Roast chicken (1.6Kg) takes around 70 minutes to cook at 200 degrees centigrade on a low rack. >> A medium sized baked potato takes around 75 minutes to cook at 200 degrees centigrade on a low rack. >> Yorkshire pudding takes around 10-12 minutes to cook at 200 degrees centigrade on a low rack. >> Frozen oven chips take around 15-18 minutes to cook at 200 degrees centigrade on a low rack. >> Small roast potatoes take around 35-40 minutes to cook at 200 degrees centigrade on a low rack. >> Parsnips cut into strips take around 35 minutes to cook at 200 degrees centigrade on a high rack. >> Frozen pizza takes around 12-15 minutes to cook at 180 degrees centigrade on a high rack. >> Poached eggs take around 5-6 minutes to cook at 175 degrees centigrade on a low rack. >> An omelette takes around 10-12 minutes to cook at 175 degrees centigrade on a low rack.